Okay! It was a huge hit! Not a morsel was left and then Daddy actually said, “That was larapin Gail!”. His highest praise…I’ve learned to accept and keep the recipe to myself:) I’m not keeping it from you though – here you go! Gluten Free, Dairy Free & All Plants! 1. Spray 9 x 13 inch glass baking pan with cooking spray. Preheat oven to 350 degrees. Arrange sliced potatoes evenly in pan (its okay to overlap). 2. Whisk together nutritional yeast, flour, vinegar, mustard and seasonings. Pour mixture over potatoes. 3. Dot with butter about every 2 inches. Bake for 50 to 60 minutes or until potatoes are fork tender. Serve piping hot. This is as cheesy as it gets. I swear, no one will ever know! *2 tablespoons of Nutritional Yeast packs a whopping 8 grams of whole protein and is a good source of B-12 making it a vegan’s best friend. Be sure and buy this organic or it may be grown on sugar beet molasses (Simply Organic is one GMO free brand). Sugar beets are one of the largest GMO crops along with corn, soy and canola. Note: If you want a traditional scalloped potato dish, just leave out the smoked paprika and mustard. Other Ideas: Melt 3 tablespoon of butter in a large sauce pan and add sauce ingredients. Bring sauce to a simmer until JUST starting to thicken. Pour over prepared gluten- free macaroni (Ancient Grains Corn and Quinoa is my favorite) for an incredible mac & cheese without all the calories. If you really want to fool them, top with gluten-free seasoned bread crumbs and shredded vegan cheese (or sharp cheddar for vegetarian). Can you say “Broccoli and Cheese” – A healthy way to get the kids to eat their veggies! This entry was posted in Entrees & Side Dishes, Food IS Talking Recipes and tagged #dairyfreerecipes, #foodistalking, #glutenfreerecipes, #veganaugratinpotatoes, #veganscallopedpotatoes, veganrecipes, vegetarianrecipes on October 12, 2017 by intuitivechef. It’s time to share more recipes in celebration of my 60th birthday month! But first, I wanted to share an “Aha” with you. This came up in conversation recently. That’s my sign it is time to share it publicly. Over the years, the Food IS Talking Intuitive Food Compatibility process has evolved as new information has revealed itself through these individualized food charts. Our sleeping cycle completely changes over a long period of time (for instance – working nights instead of days). Our nutritional needs change drastically due to illness, surgery or long term stress. Is breakfast really the most important meal of the day? It’s been drilled into our heads all our life! The first meal of the day may be labeled breakfast if you are an early riser. It may be labeled lunch if you are like me – a night owl. My first meal is hardly ever before noon. Your optimum eating style best supports your lifestyle. 3. 16 hour daily fast (eat for 8 hours only/fast for 16 within a 24 hour period). Melt butter over medium high in a large stainless pan. Add garlic and ½ teaspoon of the chopped rosemary. Sauté for about 30 seconds or until fragrant. Add water, milk and salt. Bring to simmer and slowly add polenta stirring constantly. Reduce heat to low simmer and continue to whisk for about 10 minutes or until polenta is very thick and creamy. Whisk in more milk if necessary. It should be very thick, but pourable. Coat 9 x 13 inch glass pan with a little olive oil. Pour polenta evenly into pan and allow to cool before placing in refrigerator for a few hours or until completely set. If in a hurry, place in freezer for about 20 minutes. When ready to serve, slice polenta into 4 x 4 inch squares or use a 3 ½” diameter cookie cutter (I made hearts for Valentine’s DayJ). A round wide mouth glass jar works too! Sprinkle top of the polentas with fresh rosemary and cracked pepper. Broil or grill for about 3 minutes or until tops are golden and starting to crisp. Heat a very large skillet or Dutch oven (iron is great!) over medium high. Add olive oil and butter; swirl to coat skillet evenly. Add onions with a fat pinch of salt and sauté for 3 minutes, and then add garlic. Sauté another minute and stir in herbs. Deglaze pan with white wine and simmer for just a minute before adding squash, tomatoes and beans. Bring back to simmer and cook gently for 15 minutes or until squash is tender. Turn off heat. Add miso to a small fine mesh strainer and then place strainer in skillet to allow the broth to make contact with the miso. Using a wooden spoon, dissolve miso into broth. Add lemon juice and re-heat ragout gently while stirring to incorporate miso and lemon. Taste before adding more salt. Garnish with a sprig of thyme or sage leaves before serving. *Miso is a great way to add a meaty-like richness to all your vegan soups, beans and stews. I’ve found my meat lover friends don’t miss the meat when I use this method. I use dark miso for dark dishes, such as black bean chili and light miso for lighter soups and beans. This easy and satisfying recipe becomes is a staple dish at my house. Wonderful served on top of polenta or as a hearty Italian stew with crusty bread and salad. Here’s to your Joy, Peace, LOVE & Health! This entry was posted in Entrees & Side Dishes, Evolution of Free Health, Food IS Talking Recipes, The 7 Missing Links to Abundant Health and tagged #foodintuitive, evolutionoffreeheath, intuitivechefgailblair, theplant-basedchefformeatlovers&vegetalehaters, veganrecipes, vegetarianrecipes on August 11, 2017 by intuitivechef. Evolution of FREE Health Starts Now! It’s finally done! Man, what a journey it has been. My goal was to have this birthed by Thanksgiving but the Universe had a Christmas delivery in mind. This is not the first time I have had a Christmas birthing. My daughter was born on Christmas day! 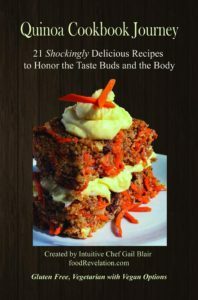 I am now accepting pre-orders for the “Special Edition” hardcover, full color book at foodrevelation.com. Just look for the book cover for ordering information. The e-book will be available in the next few weeks everywhere; Amazon, B&N. etc. The Quinoa Cookbook Journey is more than a cookbook; it also tells the abbreviated story of the amazing journey that lead me to wellness and realizing my intuitive and clairvoyant gifts. This is the first book in the “Evolution of FREE Health” series. Stay tuned for the next cookbook; “Food IS Talking”, The 10 Most Compatible Foods Cookbook, followed by “Evolution of FREE Health”, The 6 Missing Links to Abundant Health. no matter what ideas I’d held about the surprises on the chart. Dairy and coffee took a leap of faith, but I love them both now. I am back up to a healthy weight and I LOVE food! Enjoy a sneak preview of the Quinoa Cookbook Journey! Hi there! This is Intuitive Chef Gail Blair, coming to you from a little town in the heart of North Texas. I never dreamed I would be writing a quinoa cookbook! Heck, 10 years ago I didn’t even know what quinoa was! If anyone had told me 5 years ago where my passion for cooking and love for food would lead me, I would have said that someone is CRAAAZZZY! This passion led me on a journey of self-discovery and along the way I found my true calling: helping others discover for themselves their natural health and “intuitive” gifts. Yes, health is natural – chronic disease is not. Why is Quinoa the star of this cookbook? It is a complete protein (like meat and dairy); making it a vegan’s best friend and perfect for anyone looking to reduce their meat intake. AND, it is easily digested, low glycemic, nutrient dense, and alkaline to neutral in pH. It cooks in as little as 15 minutes and freezes perfectly. It also happens to be super versatile! Having very little flavor on its own, it’s like a painter’s blank canvas just waiting to be painted. So that’s what I’ve done! Created Quinoa Art! As you cook your way through this little book, enjoying every blissful bite, you will be learning how to create balance in the body. As in all of life and nature, balance is crucial to flourishing health. You will find enclosed a surprisingly delicious collection of traditional casseroles, side dishes and desserts; along with some very creative, natural ways to enjoy full-flavor food without punishing the taste buds. Many recipes are re-vamped holiday traditions. Each one has been test-driven by the most discerning foodies across the U.S. Most of the recipes in this little book are simple and designed for families to cook and enjoy together. Some a little more challenging, but easy to follow. Who doesn’t like a fun, delicious challenge? Many are “all-in-one” meals. I knew you wanted to hear that! All of them are gluten-free, vegetarian and/or vegan friendly. And, most of them freeze very well; so even the single person or small family can enjoy the luxury of having something healthful and delicious every day! 3. Many bodies are “over-proteinated” (a new word that means the body is getting WAY too much protein from mostly acidic sources). Order your copy today for the rest of the story…. Wishing you all much Peace, Joy, LOVE & Health this holiday season and always! Preheat oven to 350ºF. Coat 8 x 8 inch baking dish with a fine layer coconut oil or butter. In a large mixing bowl, whisk together flaxseed and water. Allow mixture to stand at room temperature until thickened to an “egg-like” consistency, about 5 minutes. Whisk into flaxseed mixture; milk, syrup or stevia, vanilla and spices. Stir in carrots, quinoa, raisins and nuts. Pour into prepared pan and spread evenly. Bake for 35-40 minutes until set. A toothpick inserted should come out clean. Remove from oven and let cool completely before frosting. This entry was posted in Food IS Talking Recipes, Quinoa Cookbook Journey Recipes and tagged Diabeticfriendlydesserts, gluten-freebanananutbread, gluten-freedesserts, gluten-freeg, gluten-freepumpkinbread, healthyholidayrecipes, quinoacasseroles, quinoarecipes, veganrecipes, vegetarianrecipes on November 21, 2016 by intuitivechef.